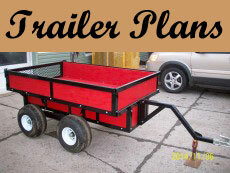 Information Outfitters - equipping you with over fifty years of outdoors experience! What is the best approach for hunting moose in the late season? After the rut where do all the bull moose go? I know that a moose hunter cannot call bulls after the rut, so how can I find them? I have heard that bull moose will form into bachelor groups after the season? Does anyone know if this is true? I can only hunt moose during the late season because of my work, so I really need some tips as to how best to hunt bull moose during the late season. BTW, I am a bowhunter so I need tips to be able to get close to moose. I practice a lot out to 60 yards and am very confident in shooting to this range. Please give me some good tips for bowhunting moose during the late season. Sounds like you have it figured food and cover they spend more time eating to try and gain back the fat they lost chasing cows. Also cover they are tired and need rest, also the second rut is good if you have lots of cows and not enough bulls to breed them the first rut. Making moose noise is a good idea but not always bull sounds. Making cow and calf communication noises while still hunting helps but you still need the wind. Cold weather helps too as they feed more and when light levels are lower they feed more because they feel safer. I have been hunting moose since 1972 and guiding since 1983 moose are the best. I live in Northeastern British Columbia, Canada, and have hunted moose for 40 years. There is no question they change their movements and habits after the rut and going into winter. During the rut they continue to move through the landscape in search of cows, with little concern for browse or safety. Post-rut they will be found in areas rich in browse and water, including second-growth log blocks and near large beaver ponds. It isn't uncommon to see them eating late growth alfalfa in the rancher's fields. I think they are believed to travel in bachelor groups because they appear to be herding, however, a rich food source will draw numerous animals until it is depleted, and they move to the next. Their motivation is all about putting on weight to survive winter, rather than companionship. My preference later in the season, once the leaves fall is to hunt creek/river banks and the edge of beaver ponds or sloughs as food and water are more plentiful. quite simple.you need to go higher ground.I live in newfoundland and hunt often.I just shot a bull last week and the cow was still hanging around. This time of year they like to high ground and not the bogs.they also like herding up for the winter.there is a very good chance that if you see one there are more hanging around.I just bottle up 48 bottles today and looking forward to another hunt this weekend.I don't get to shoot anything but it's fun to tag along. After the rut is over, the bulls will still hang around lakes and rivers. I shot one in N W Ontario in mid November. This one was breaking through light ice to get to the lily pads. Don't forget to hunt in burned over areas and old logged over areas..
Moose like secondary growth like willow and maple brush, and after about 4-5 years that's where its at. Sometimes its so quiet in the bush that if you see signs that moose are in the area you might have to do like I did to get a kill. That's crawl on your belly to get in close enough for a good clean shot. I plugged one in a field of snipped maple brush that appeared as if somebody had gone through it with a pair of shears. Interestingly. since their eyes are on the sides of their heads, they keep turning their heads from side to side to try and get a good view of whats out there coming for them. I could just see their antlers twisting before I shot one. Your site is awesome- very helpful ! Heading to Quebec for fly-in moose hunt Oct. 6-12, 2012. Hope the rut is still on. Do a google search for Wayne Kubat ..
After the rut bull moose want to get into some good food source such as young willows so they can recover from the stress and miles put on during the rut. They need to add some weight and fat for the winter months . Look for moose around beaver dams , or logged out areas where the willow trees and poplar are starting to grow back. You will likely find bulls browsing steadily. Move slowly and into the wind and if you know how to make moose talk you will easily be able to stalk within 30 yards for a bow shot. Thanks for your comments BigBore. Good luck in finding a bull, and of course don't forget to come back and tell of your experiences. It is helpful for all of us to learn new strategies for late season moose hunting. The information about the moose going deep into the woods at this time of year has been show by studies done by wildlife biologists. Now it is up to you to find them. Even though your main rut may be over there can be on occasion cows that come into estrus later than usual, cow calling during the late season can sometimes still be effective. Thanks for some of this information. I was lucky to draw a New Hampshire moose permit this season but it is basically in the center of the state where the rut is past and the moose population is scattered. In 2004 I drew a NH permit in the northern part of the state and took a nice bull. The moose density is much more and the colder weather made them move as well as respond to a call. I have hunted for the first part of the week and saw one small cow. What bothers me is that there seems to be no fresh sign. No fresh tracks, no fresh droppings nor sign of twigs being eaten. Anonymoose, you are correct bull moose will often congregate into bachelor groups after the rut. Have a look at what happens after the rut. Cow moose and their calves will continue inhabiting the areas near water for safety. The bulls will stop their aggression toward each other and will certainly stop following the cows around. 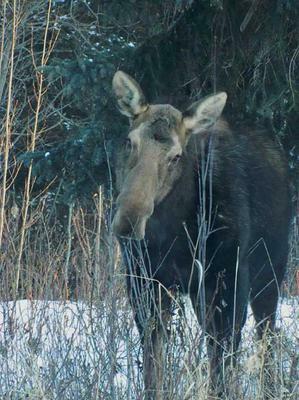 As winter approaches, bull moose need food... and lots of it. During the rut they were on the move so often and ate so little they burned off much of their fat reserves. They now need to replenish those reserves for winter. Less time now will be spent sizing up their opponents, it is time to concentrate on one thing... food. The bulls will mostly return to high ground again searching for food until the snow becomes too deep and pushes them toward the wintering grounds. What types of food will the bull moose will be seeking? Poplar and willow saplings, tree bark and twigs. Bulls will be found where large quantities of quality forage can be found. They will not move around much other than to eat, drink and rest. The best late season moose hunting tip I can give you is to hunt in the forest away from the forest openings and most importantly... away from human traffic. After the rut, bull moose move away from where you typically find the cows (lakes and ponds). You might find them in bachelor groups but more often they hang to themselves. You are right, bulls do not respond to calling once the rut is over,but... I think if you can locate a bull, you could use calling to fool a bull into thinking the noise he hears approaching is another moose. This way you can stalk closer to get within bow range. I use this method to approach bedded white tailed deer during the elk rutting season. It works awesome, I have stalked to within bow range on several occasions this way. I have not tried this on moose,but if it works for deer, why not for moose too? In late season I usually see moose higher up in the mountains back in the thick forest where they can avoid human and predator contact. Good luck with your late season moose hunts! Join in and write your own page! It's easy to do. How? Simply click here to return to Moose Hunting Tips. Want to learn how to hunt moose? Or are you wanting to increase your moose hunting skills? Our moose hunting tips book is written with not just the novice in mind, there are tips in the book that even the most seasoned moose hunter will find of value. 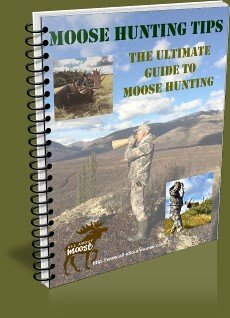 The book includes 57 chapters, with more than 150 pages of information, jam packed with tips, techniques and discussions - The Ultimate Guide to Moose Hunting! Good morning Mark, I want to thank you again for your outstanding service. 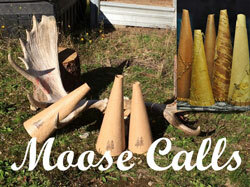 As luck would have it, when I arrived home after work yesterday the moose call was in my mail box. It figures when the Postal Circus is involved. 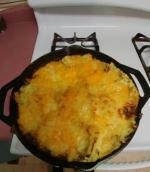 Manya from Tampa Bay said: My sister-in-law came down with a box of goodies from Alaska. One was a moose steak. I have thought about cooking it but didn't know how. I looked on your site. Thank you so much for having such wonderful ways to fix moose. "I just wanted to let you know how much I love your site and how much I appreciate all the help you give everyone. I have learned so much from this site. It is my go to guide for moose hunting. You have a great way with words and make this site very approachable for new hunters and very informative for both new and veteran hunters alike. Thank you for all your hard work. Again, it's a fantastic site, keep up the great work." Cool website, nice to see others that consider the moose as a majestic creature. We are going to park the quads this year and use the boat, get away from the others. Will let you know if it is a successful hunt. 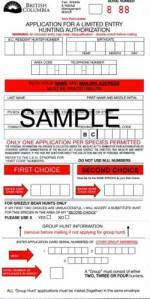 BC Limited Entry Hunting – Does it work for you? Limited Entry Hunting in British Columbia is for residents of BC only. How well does the system work for you? Do you get draws or not?